The kids can make their own globe, and have fun trying to get the continents in the right spots. 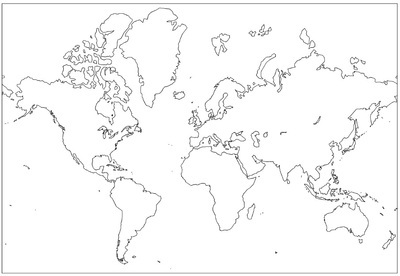 Print the world map template below. I got it from this awesome website. Ours was printed on A4 paper, to be more accurate it should be double the size. Let the kids decorate the continents, maybe add labels, find countries or add flags. Cut out the continents. Allow a little bit of space around some of the smaller islands or tricky bits, just colour the water in blue. Blow up the balloon and hold it so the tie is at the top. Put sticky tape circles on the back of the continents and stick them onto the balloon, trying to guess the right spot for them. Extra decoration can be done - draw sharks in the water, mermaids, ships, whales etc. The tie is at the top so that the balloon can be hung from a string. You can also make the other planets if you wanted to, a yellow balloon for the Sun, Mercury (little) and Venus (big) are brown, Mars is red, Jupiter is stripy, Saturn has rings, Uranus is pale blue, Neptune is darker blue, and Pluto doesn't seem to count any more. You could also make the moon from a white balloon. Take a torch and shine it onto the balloon. Talk about the sun shining on the earth, and turn the balloon slowly to show how the day goes and how the sun rises and sets. Shine it on a moon balloon and get the child to stand side-on to the 'moon' and see the crescent shape. Create your own world. Pick a balloon colour, create continents, give them names and describe what it is like to live there, talk about how each country gets along with their neighbours. Great activity - will try this.